Prices of vacant residential land in capital cities across Australia are on the rise as a recovery in home building activity causes demand for vacant lots to increase faster than supply, a situation which is leading building industry groups to repeat calls for further planning reform. Published by the Housing Industry Association in conjunction with property information provider RP-Data, the latest HIA-RP Data Residential Land Report shows conditions within the Australian market continued to tighten during the December quarter as rising prices in Melbourne, Adelaide and Perth pushed up the weighted mean residential land value across capital cities by 3.5 per cent to $326,184 – meaning average prices are now a whopping 22.3 per cent above their level in the same period in 2012. Average lot values in regional markets also rose 2.1 per cent, meanwhile, though pressures are less evident in these markets as prices are up only 3.5 per cent year on year. 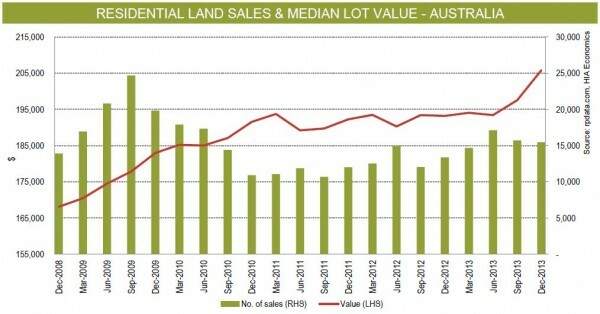 At the same time, the volume of residential land sold during the quarter (usually a reliable forward indicator of the near-term outlook for residential construction) dropped 1.8 per cent as a pick-up in softer markets such as Melbourne, Adelaide and Hobart was insufficient to offset lower turnover in Sydney, Brisbane and Perth. Volumes are, however, now at much healthier levels when compared with the housing slump in 2011. RP Data research director Tim Lawless said demand for new housing has been underpinned by a combination of low interest rates and government grants for new housing even as sales of land were trending lower, a situation he said would flow through into higher prices and impact affordability. 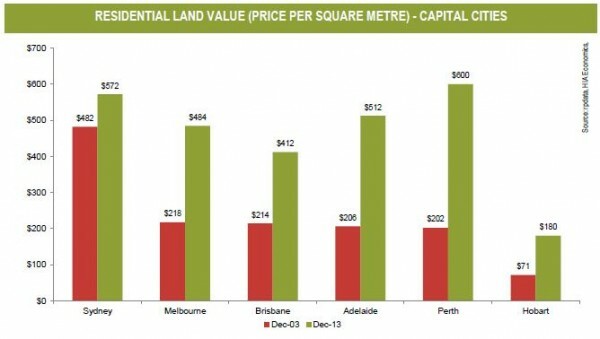 With a median price per square metre of $600, Perth stands as the most expensive capital city in which to buy land following by Sydney and Adelaide, while the Gold Coast ($431) was the most expensive regional market. 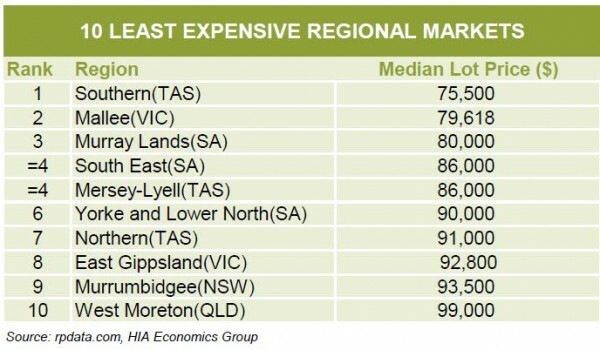 At the other end of the scale, Hobart ($180 per square metre) is the least expensive city, while Southern Tasmania ($96) is the least expensive regional market. The fastest growing regions in terms of transactions (six months to December) are Gold Coast, Mallee (Vic) Outer Adelaide, Murrambidgee (NSW), Richmond-Tweed (NSW) and Melbourne, indicating developer activity in these markets is likely to strengthen in the near term.